Walter Lawson is remembered for his warmth and caring as much as for the horns he built and repaired, and he led the way in research into what made horns sound beautiful. He contributed to the horn world in important ways and inspired many people with his energy, kindness, and creativity. Lawson, the son of British parents, studied piano and horn as a youngster growing up in Binghamton NY. During World War II, he was a teletype mechanic for the Associated Press and served in the US Army Military Police and Signal Corps in the South Pacific. In 1947, he entered Peabody Conservatory, studying piano with Frederick Griesinger and horn with Jerry Knop and Ward Fearn. He was second horn in the Baltimore Symphony from 1949 to 1976. "He had an ability to match tone and intonation that was uncanny, and he made anyone he played with sound good and feel comfortable," says Bill Kendall, his lifelong friend, colleague in the Baltimore Symphony, and employee in the shop. "A true section player, he was always in 'support mode' on stage as well as off." Lawson began working as an instrument repairman in 1949 at Ted's Musicians Shop and opened his own shop (Lawson Brass Instrument Repair Company) in 1956. His reputation as an expert repair technician and custom mouthpiece maker spread quickly, and many leading horn players sough his expertise and support. A fascination for improving horn mouthpieces led to his development of a mouthpiece kit with interchangeable rims, cups, throats, and back-bores that had over 12,000 possibilities! This allowed hornists to experiment and perfect a truly custom mouthpiece, which Walter would then produce. This led to studies of the lead-pipe, and by the early 1970s, Lawson was making custom pipes of his own design for installation on stock horns with great success. He then moved to investigating the properties of alloys and hardness of bell flares. When he left the Baltimore Symphony, he moved to Boonsboro MD and in 1980 formed Lawson Brass Instruments with his sons Bruce, Duane, and Paul. Research and development of custom parts continued with modifications to existing instruments and production of the first Lawson horns in 1981. The Lawson Team continued to make acoustic and mechanical innovations, and the company thrived, producing many different models of double and descant horns as well as mouthpieces and custom parts. The input of many professional players, including Barry Tuckwell (who lived nearby), was essential to their work, and Lawson equipment can now be found in the ranks of orchestras and on recital stages throughout the world, used by professionals, amateurs, and students alike. Walter Lawson retired in 2006 and the family sold the company to Kendall Betts, who carries on the Lawson tradition in New Hampshire. 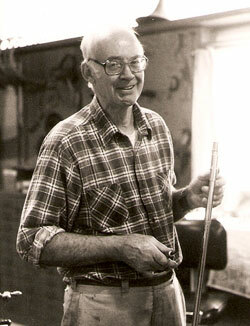 Lawson exhibited his horns at international and regional workshops, often giving presentations that helped open communication between hornists and makers. He was a member of the IHS Advisory Council from 1977-1983 and elected an IHS Honorary Member in 2001. Tributes appear in the October 2007 issue of The Horn Call.